Today, Toyota announced that they will be recalling 690,000 midsize Tacoma pickup trucks in order to fix the rear suspension. 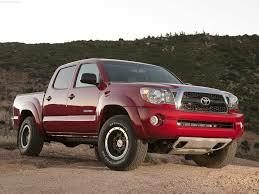 The models involved in this recall include Tacoma 4×4’s and Tacoma Pre-Runners from years 2005-2011. So far, there have been no reported injuries leading to the defect, but even so, everybody needs to get their trucks taken care of so they don’t get fried to a crisp! This entry was posted in Culture, Toyota and tagged 000, 690, Pre-Runner, recall, Tacoma, Toyota. Bookmark the permalink.